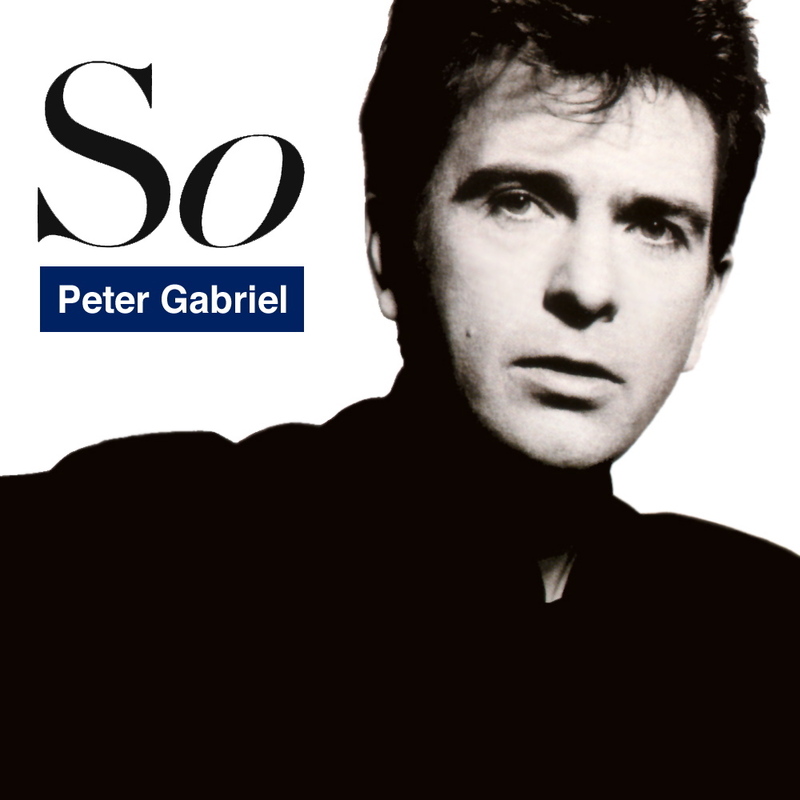 Today’s POP RESCUE from a loveless fate, is the 1986 fifth studio album So by Peter Gabriel. This 9 track album opens with the racing hi-hats Red Rain, soon followed by Peter’s slightly raspy vocals. This track has some pretty damn funky bass, and in true Gabriel style, it’s an epic piece of sound. It reeks of its 80s pop-rock genre, but does so, gently. The song flows perfectly, towards the fade, just like the rain it sings of, leaving Peter to sing the song out. I really like this track, but when it was released as the final single, it stalled at #46. This is followed up by his huge hit and lead single, Sledgehammer, a wonderful piece of 80s chart pop. The horns and bass lead this chugging track. Peter’s vocals are lighter, almost playful here, and he wields them with great ease through the verses and chorus. He’s aided by soul singer PP Arnold (amongst others) on backing vocals. This is a catchy track that was quite rightly a hit for him. Dont Give Up is up next. By contrast, this is a much more mellow start, and briefly there are vocal twangs of Sting. But, then suddenly, you realise that he’s not alone, and that Kate Bush is on vocals too. The song softly flows, with the vocals giving the perfect contrast. Apparently the song was originally intended for Dolly Parton to duet with him, but she declined (i’m not sure how that would have sounded!). Eventually a piano arrives, giving the song a slightly bluesy sound, before a funky bassline takes over, sounding like its walked in from the next session. This was the second single from the album, giving Peter and Kate a #9 UK hit. That Voice Again is up next, beginning with some delicate little piano and synth keys before a beat and bass come bursting in. This is quite a belting song. Gentle synths usher in Mercy Street. A dull lone bass note tolls like a bell. A percussive sound alongside a whistle-like synth sets the scene for Peter, and they weave throughout this somewhat wafting, dreamy track. ‘Hi there!’ starts the next track Big Time, and the music bursts in. This, is the closest track here so far, to his Sledgehammer hit. It also reminds me a little of some of the early Holly Johnson solo tracks from his Blast! album. PP Arnold is back again, helping to make the vocals aptly bigger. This is a great big fun track, poking fun at 80s society, and it acted as the fourth single, reaching #13 in the UK charts. We Do What We’re Told (Milgram’s 37) follows, filled with some great beats and synths. The song slowly builds, to eventually add in a chanting of the song title. Peter’s vocals sound a little Bowie here, but he’s gone before you get to hear much. Up next is final track This Is The Picture (Excellent Birds) featuring Laurie Anderson on vocals. Again the song builds up, but slowly with vocals and bass this time. There’s some great percussion and little synth parts here. Over all, the commercially sounding Sledgehammer and the collaboration with Kate Bush, undoubtedly helped Peter to gain the attention he won with this album. There’s some wonderful sounds and styles here – vocally and musically. It manages to hold tightly to the more artistic soundscapes whilst also pandering to 80’s chart pop-rock. As a result, now in 2015, it seems tame, light, and somewhat middle of the road. Where is Peter Gabriel now? Peter continued to record and release singles and albums after this, making only one other Top 20 single in the UK with his hit Steam (1993). Whilst So remains his most recent (and second) #1 album, he achieved great success with his 1992 album Us, on which single Steam appeared. He is a renowned performer, and his shows are known as hugely visual and artistic. This has led him to tour extensively, and use digital media. He also co-directed and wrote the music for the Millennium Dome Show in London, which ran during 2000. His most recent album, New Blood, was released in 2011 and features orchestral versions of his earlier material. 1986 UK CHART POSITION: #1, certified 3x Platinum. POP RESCUE COST: 99p from an Age UK store. Posted in 1980s, Peter GabrielTagged 1986, album, Big Time, Don't Give Up, In Your Eyes, Kate Bush, Nile Rodgers, PP Arnold, Red Rain, review, Sledgehammer, SoBookmark the permalink.